Recently, we told you that new studies are reporting that men who have used Viagra for ED had a significantly elevated risk of melanoma. New studies prove there’s yet a new concern. One of the most well recognized brand-name medications,Viagra is used to treat erectile dysfunction (ED) by relaxing muscles and increasing blood flow to particular areas of the body. New research has indicated that approximately one out of every 50 men who have used Viagra may experience visual disturbances. These disturbances can include blurred vision, sensitivity to light, and even total blindness. 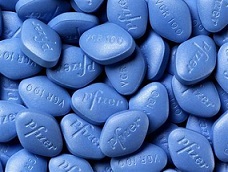 Researchers are now reporting that Viagra may not be suitable for men who carry a gene mutation associated with the inherited eye condition, retinitis pigmentosa. Retinitis pigmentosa is a hereditary condition that causes progressive loss of light reception and the outer fields of vision, leading to tunnel vision and blindness. As temporary visual disturbances have been reported by some people after taking sildenafil, a study investigating the effects on the retina of mice was conducted. The researchers wanted to see if the effect of sildenafil on sight was greater if there was a susceptibility to retinal damage. It is estimated that 1 in 50 men are carriers of a single copy of a gene for one of several degenerative retinal conditions, but have normal vision. To test the theory, the researchers used mice genetically engineered to be carriers for this degenerative condition, and checked if they were more susceptible to visual disturbance. Crazy stuff here. This study showed that those mice with genetically engineered retinitis pigmentosa are more susceptible to the temporary side effect of visual disturbances than normal mice. These carrier mice also had increased levels of the chemical cytochrome C, which is an indicator of cell death. There was, however, no sign of cell loss or change in retinal thickness in any of the mice retina. As such, the research did not prove that sildenafil causes permanent retinal degeneration because the changes were reversible in all mice. The smallest amount of sildenafil used in these experiments was five times the equivalent recommended dose for men, so it is not clear whether similar results would be seen at normal dose levels. Previous research in humans found that 50% of healthy men who take at least double the maximum recommended dose of sildenafil will experience the temporary disturbances. What does this mean to Joe Consumer? Probably not much, since the effects appear to be reversible. It is, however, recommended that if you experience a sudden decrease or loss of vision, you should stop taking sildenafil and contact your doctor immediately. Will the most recent health related concerns put a dent in sales? With more than $2 billion a year in annual sales, probably not, but only time will tell. It does spark concern though, this in conjunction with the melanoma scare. What other health concerns are a genetically designed mouse away from being discovered?